FINALLY!! 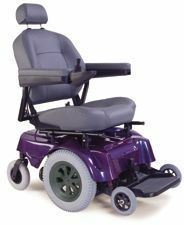 A Truly Light Weight Power Wheelchair!!! This is a very unique product that has been long awaited in the mobility market! Many power chairs claim that they are transportable, but no other on the market today disassembles as easy as the At'm, with the heaviest piece weighing only 34 Lbs.!!! If you can set up a lawn chair, you can set up the At'm, no mobility lift needed! This chair disassembles into 3 easy to handle light weight pieces with no tools in less than 1 minuet! 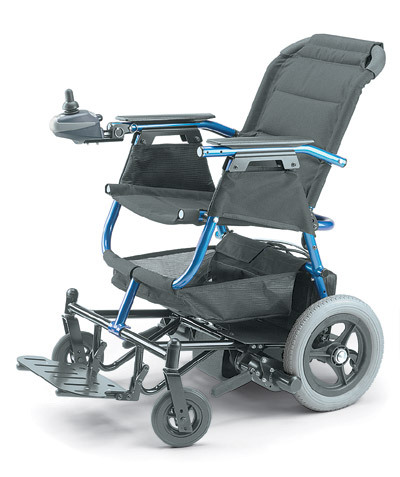 The At'm has many great features such as very comfortable, light weight, removable and washable nylon upholstery, undercarriage and side pocket storage and flip-up footplate. 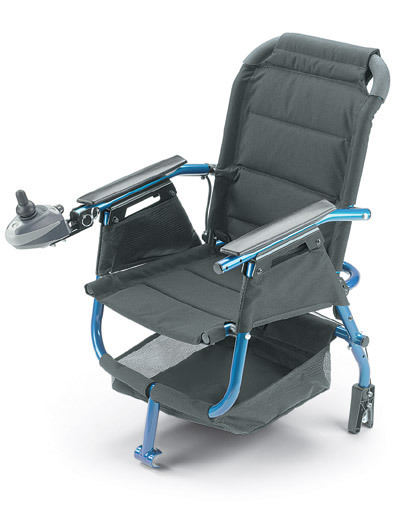 This chair also has a unique design that allows it to be pushed like a regular wheelchair when you choose not to use the power option. The gearless traction drive technology provides smooth, stable operation and the light weight removable battery pack will offer 12 miles of continuous travel. 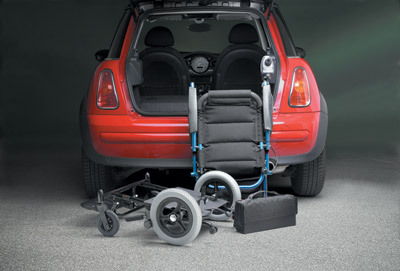 This is the most versatile, portable Power Chair on the market today! The At'm fits in the Smallest Spaces!! If you can set up a lawn chair, the At'm will be a breeze! First, place the base on the ground, the wheel locks will hold it steady. Then fold open the seat like a lawn chair and lock it onto the base. Put the battery in place and plug it in. Your power chair is up-and-At'm and ready to go! Base section weight - 34 lbs. Seat and Arms weight - 14 lbs. Battery pack weight - 27 lbs. TOTAL WEIGHT - 75 lbs.!!!! 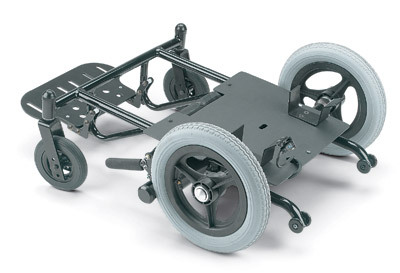 So Easy to Assemble, you'll be on the go in less than 60 Seconds!!! Place the base on the ground and lock the brake. 34 lbs. 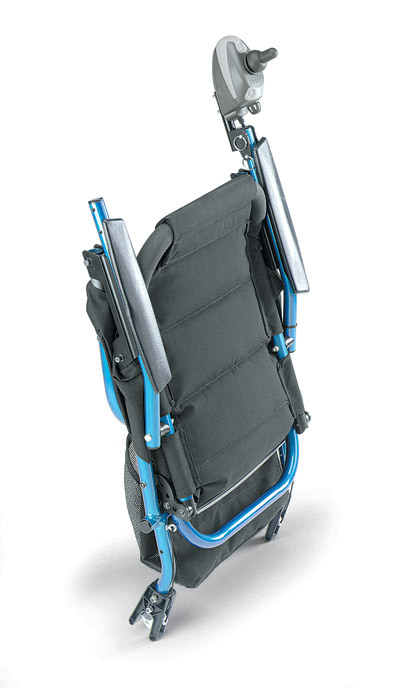 Unfold the seat, just like a lawn chair, and easy snap and lock on the base - 14 lbs. Insert the battery pack and plug it in - 27 lbs. Your power chair is up-and-At'm and your ready to go!! Gearless traction control gives you the performance to drive on wet surfaces and up hills. The key is the forward drive system and superior electronics. To push the chair from behind, simply lift the drive disengagement levers. 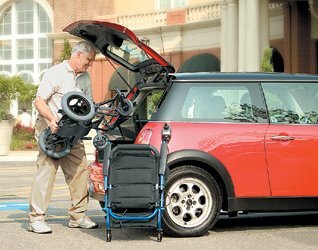 The At'm is so easy to take apart and so compact that it will fit into the trunk of even the smallest vehicle. This is the perfect chair to take along anywhere you go! Disassembles into 3 easy to store and handle pieces, with the heaviest piece weighing only 34 lbs.!!! Standard seat width of 18". Also available in narrow 16" seat width. Carefully designed, easy to clean and breathable seat fabric. 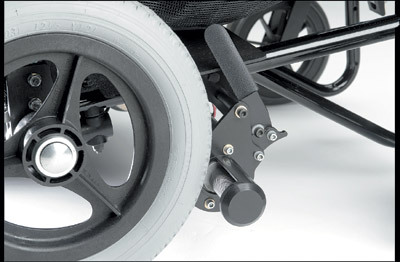 Can be easily pushed like a companion chair when in free wheel mode. 36 month warranty on frame, 12 months on electronics. Available in 18" or 16" seat widths. Light weight frame available in blue pearl or candy red pearl. Great for indoors and outside! 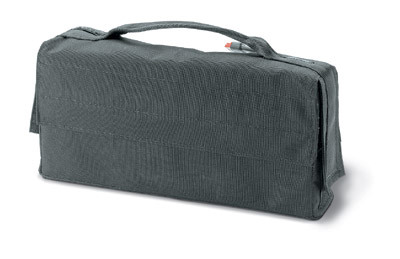 Perfect for cruise ship, train or airline travel.